The campgrounds & RV parks below are listed alphabetically under the state in which they are located. Cities in each state are listed to the right with a link to the city guides for more information. We also have a list of RV Parks by state and their telephone numbers at Mexico RV Parks. Our beachfront is 8 miles North of Ensenada, next to the Pacific Ocean and is a beautiful place for families to relax. We have over one mile of coastal property, all fenced and gated to enhance your security. We have employees on the property 24 hours/7 days a week to provide you friendly service. 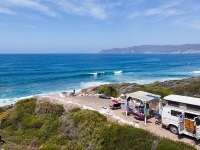 We have private campsites available on the beach and on the cliffs above. We take pride in our clean, maintained camping areas and our clean restrooms with flushing toilets and showers. 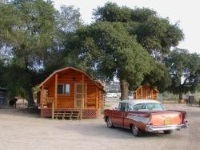 The Rancho Ojai campground at Tecate is a working ranch situated in rolling countryside dotted with large Oak trees. The campgrounds are ideally suited to both singles and family groups and offers a wide range of activities. Whether you need an RV Hookup, Tent campsite or Cabin you'll find a wide range of options for accommodation. The great thing about Rancho Ojai is that there is simply so much to do. Join us for horseback rides, swimming, mini-golf, and many other activities. Historic Hotel Serenidad offers RV spaces along with a restaurant, bar and swimming pool. 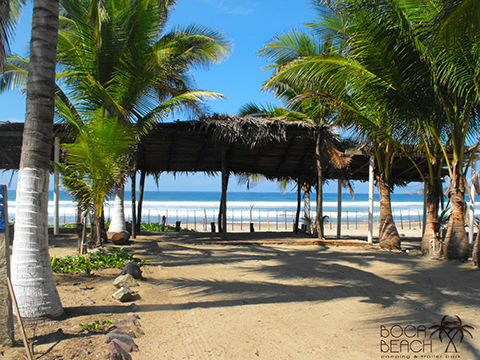 We are a resort campground & trailer park with all facilities located beachfront on "Playa Boca de Iguanas". We are a family camping with over 30 years experience. Our goal is to create a peaceful and friendly atmosphere. Some of our services include restrooms, showers, water and electricity in each space, drainage for RVs, spaces with palapa in front of the beach, bungalows in front of the beach & more.